Reading Ready Player One was like experiencing almost all of the best things in life. I say almost because there's nothing about being a dad in there, but there's a lot to offer. Reading the book was like playing all of my favorite video games, hanging out with close friends, falling in love, going on risky adventures, facing odds that seem impossible, and so much more. Did I mention the book is jam packed with classic 80s pop culture, especially having to do with video games? Yeah, as many dudes my age and a bit older I'm sure have said - it seems like this book was written for me. This book has stuff about just about every geeky thing I love. In an interview I heard Ernest Cline say something like: "I think this is the geekiest book ever written." This is the most fun I've ever had reading a book, and one of my favorite things to do in the entire world is read a book - so it was kind of amazing. I'm also a writer of fiction so I really appreciated the fantastic story told in this novel. I couldn't read this thing fast enough, and yet I wanted to savor every chapter and didn't want it to ever end. The characters were fleshed out so well they reached out of the page, or in may case out of my earphones, and into my head where they lived and breathed. I was rooting for them the whole time and was so excited for them when they went up against bad guys. There are so many cool adventures that are so awesome for so many reasons! Many of them are like quests in video games you have loved. If you're a gamer you will be putting down the controller and using your well practiced fast fingers to turn the pages instead of mashing buttons. This book was so many things, it's kind of hard to sum up all of them and say why the book was such a pleasure to read. The villain was excellent as well, a dude you just loved to hate. All of the characters were very believable and very much their own person that I felt I just happened to be reading about. 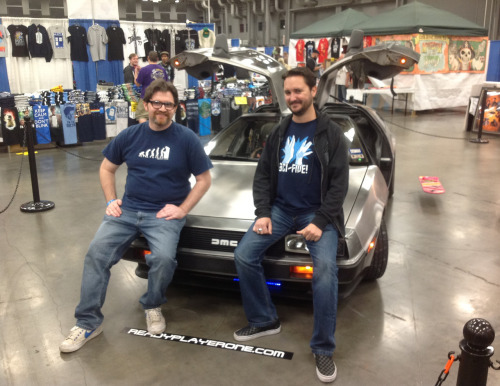 The author Ernest Cline with the Audiobook narrator Wil Wheaton. I read this book by listening to the audiobook. It's how I do pretty much all of my reading because I have 2 hours of commuting a day, and I simply love audio books. Wil Wheaton is the narrator for this book, and he's the perfect man for the job. You can really tell that he's as excited as you and the characters are about all the cool stuff going on and cool retro gaming stuff you're geeking out about. You can tell it's a book that he absolutely loves, and his enthusiasm comes out so well and really makes the audio book a fantastic listen. If this audio book were a game, Wil Wheaton would get the high score as narrator. One last thing that I think is easy to glance over because Ernest does it so well. The world of this book is at times so amorphous that I could imagine clearly writing what was going on would be immensely difficult. Cline pulls it off seamlessly. You have your character, who's usually in an artificial world, and then many times playing an old school game inside of that world, so you're reading about a character playing or sometimes being inside a game within a game. It's a bit Inception, but so much more fun. And that's what I'd like to sum up this review with. This book is fun, ridiculously fun. It's also an amazing story. I wonder just how many times I'm going to be rereading this one. Probably as many times as Wade has read Anorak's Almanac. Pick up the novel in paper, eBook, or audiobook on Amazon. 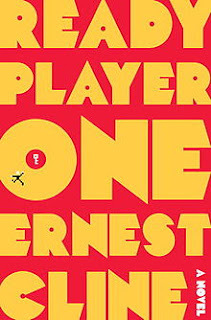 Check out the author Ernest Cline's awesome website that is retro game themed. Check out all the awesomeness that is Wil Wheaton who narrated this book. Thanks for stopping by and you're welcome. Now you know about READY PLAYER ONE.